I just dream/write about him; I don’t even have to try! He’s the smart hero of my novel, while I’m the writer shy! Great to earn the WOW Badge HERE! Shy writer, but a bold winner you are I must say. But, the truth is such love & passion results in great works of art! Novels, Paintings, Sculptures...spring to life as the artists indulge in uninhibited love. I believe in it! Wow!!!! So beautiful, graceful, thoughtful. Full of the minute emotions a writer holds within her mind. Kudos!!! Thanks Deepanshi for stopping by :) For a beautiful mind everything looks beautiful! Though the Topic is 'LOVE', this is KISS actually- Keep It Short & Simple! Thanks Prasanna. yes indeed! Even I feel so. Beautifully woven just loved it <3 !! Thanks a lot Mukulika! Welcome to my Blog! Author & Novel- Great combination! Thanks for stopping by & reading & sharing :) Glad you liked it! first time here, thanks to blogadda...sweet lines. Writing a novel is passionate and how can you not fall in love with your hero , your creation? Richly deserve the WOW badge. expressions beautifully expressed. Short sweet poem. 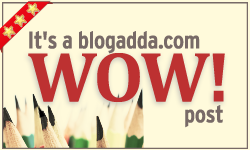 Thank you so much Pankaj :) Welcome to my blog!